As a solo artist, he has released two instrumental projects that have garnered widespread acclaim from around the globe. 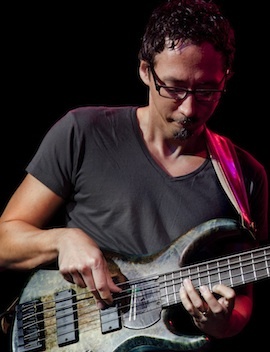 His latest solo project, Tea In The Typhoon, features stellar guest artists John Patitucci, Gregg Bissonette, Lincoln Brewster, Michael Manring, Etienne Mbappe and more, and further affirms Norm's reputation as a world-class bassist and composer. Norm is also known internationally as a bass educator and clinician. His bass instructional DVD series, Grooving for Heaven (distributed by Alfred Publishing), has sold extensively in the United States and abroad. He is adjunct faculty at Biola University in Los Angeles and has conducted master classes at The Los Angeles College of Music, Liberty University, Tech Music School London and more. He also serves as a bass columnist for Worship Musician magazine. His book, "The Worship Bass Book: Bass, Espresso & The Art Of Groove", is published and distributed globally by Hal Leonard Corporation.